Do you know, I didn’t realize they had a blush-colored breast. I love having nesting birds. We have three or four sparrow families every year. They aren’t exotic, but I do find their company cheering. Jan, the males are brilliantly colored. As tropical as we get here, although in my old state of Connecticut there are brightly colored keets too. We have LOTS of sparrows as well. They do sound cheerful, but sometimes they take over a nesting box, which I highly frown upon. I remember being told the old classic ‘foo bird’ joke by my neighbor when I was a kid. I was probably 12 and he was about 24. He was ‘the cool neighbor,’ and I was honored that he told me a joke with cussing in it. I fake-laughed at the punchline (when the foo shits, wear it) because I didn’t get it. I’d never heard the original (when the shoe fits, wear it). I’ve often thought of it since, and for me the joke offers classic lessons: acceptance; not every aspect of life can be pleasant, but it could be worse. We had blue birds at a cottage we once rented. They are gorgeous, aren’t they? Ya know, I have to confess I hadn’t heard that one before. Given the personality of my youngest, though, I’m sure it is in my future. What types of birds do you see? Lot of hawks? Wow are you lucky!! I used to get all sorts of great little birds, the chickadees and nut hatches were my favorites. But since they closed and covered up our landfill the crows and seagulls moved on and right to my feeders! You think a blue bird can poop? HAH! I have never seen a bluebird. Send some my way, please. We did have two black vultures down the street yesterday … I could happily send you one of those! 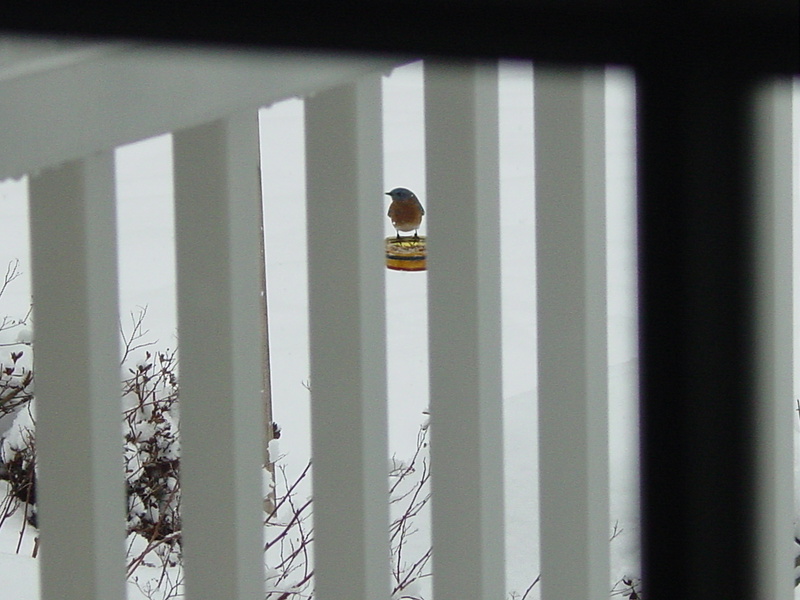 Your bluebirds are eating our birdseed and sleeping in somebody else’s house. There may be a name for that behavior.